The sweet story (and more) behind the Top 40 Greatest Desserts of all time. What makes the worlds greatest Red Velvet Cake live up to its name? You’re only a click away from the greatest desserts you will ever taste. All of the world’s greatest desserts in one place – you’ve found it! A love affair with desserts that began at age 10 finds a sweet path to the pages of Rick Dees All-Time Top 40 Greatest Desserts. Building on the theme of his enormously successful music show, the Rick Dees Weekly Top 40 Countdown, Rick Dees transitions flawlessly from his passion for music to his passion for desserts. 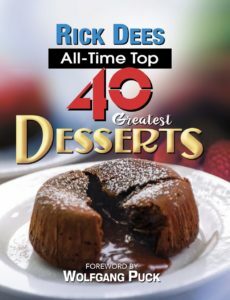 Perfect for gift giving and chefs of all ages, Rick Dees All-Time Top 40 Greatest Desserts is now available on Amazon.com. Hurry….they’ll be sold out soon! BUY THE #1 DESSERT BOOK NOW! CLICK HERE! These desserts are NUMBER 1! Hurry and get yours before they’re sold out! © 2018 Dees Creations, Inc. All Rights reserved.